The name Pere Marquette is more than just a great salmon fishing river in Northern Michigan. The name itself comes from Father Jacques Marquette, a French Jesuit missionary who founded Michigan’s first European settlement in Sault Ste. 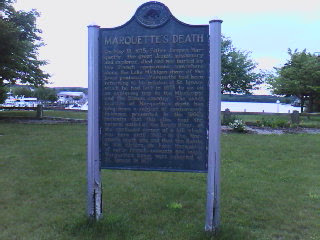 Marie and later also founded St. Ignace in the Straits of Mackinac. Jacques Marquette is now more commonly referred to as “Pere Marquette”. He was a very successful and influential missionary to the First Nation's people of Quebec and Native Americans in Michigan. Apparently there is some debate about where Father Marquette died, but many historians believe it was here along the banks of the river near a hill in Frankfort. I came upon a historical sign telling a bit of his story while walking to the lake shore on Friday morning. Although he was buried in St. Ignace, Father Marquette may likely have died here in Frankfort. Great idea for a blog Kevin. Safe sailing and I hope you have a great trip. In a couple of years I hope to be doing the same with my family. We just bought a 22' that we are fixing up to do some cruising. Excited to see how your trip goes. Thanks, David.